The Renewable Energy Landscape is a definitive guide to understanding, assessing, avoiding, and minimizing scenic impacts as we transition to a more renewable energy future. It focuses attention, for the first time, on the unique challenges solar, wind, and geothermal energy will create for landscape protection, planning, design, and management. Policy recommendations for political and regulatory bodies. 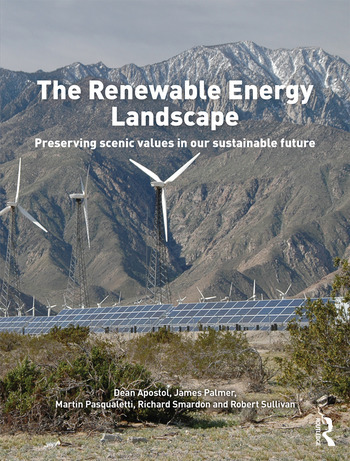 A comprehensive and practical book, The Renewable Energy Landscape is an essential resource for those engaged in planning, designing, or regulating the impacts of these new, critical energy sources, as well as a resource for communities that may be facing the prospect of development in their local landscape. Dean Apostol is Senior Landscape Architect and Restoration Ecologist for MIG Inc, a consulting firm with offices in California, Oregon and Colorado, USA. He researches, consults, and does environmental analysis on energy projects and aesthetic impacts. James Palmer has had a distinguished professional career in landscape architecture spanning thirty-five years, focusing on the assessment of landscape character and aesthetic quality. Through publications, peer reviews, court expert testimony, and teaching, he has raised the standards in the field. He frequently consults on wind energy aesthetic impacts in the Northeast. Martin Pasqualetti is Professor in the School of Geographical Sciences and Urban Planning at Arizona State University, USA, and a Senior Sustainability Scientist in the Julie Ann Wrigley Global Institute of Sustainability. For over forty years, he has been examining the relationships between energy and environment, especially the formation and mitigation of renewable energy landscapes. Richard Smardon is a SUNY Distinguished Service Professor Emeritus at the SUNY College of Environmental Science and Forestry in Syracuse, New York, USA, and has over thirty-five years of experience with visual impact assessment methodology development, twenty years of project management, and has testified in over fifteen cases with visual impact assessment issues. Robert Sullivan is an environmental scientist in Argonne National Laboratory's Environmental Science Division, USA. He conducts research on the visual impacts of fossil fuel and renewable energy systems, and develops guidance documents for federal agencies on visual resource inventory, management, and protection.